Literally, 5 minutes start to finish. A little Hawaiian salt and balsamic bring all the flavor of even winter tomatoes. And that's saying something. 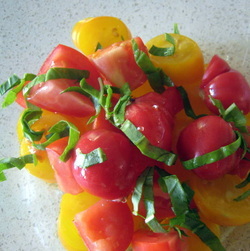 To be fair, if you do add the basil ribbons, it might take you 7 or 8 minutes, but this is well worth it in the summer. Wash and halve the small tomatoes. If using bigger tomatoes, cut into bite-sized pieces. Sprinkle some Hawaii salt over it and wait a couple of minutes. Drizzle with olive oil and add a splash of balsamic vinegar right before serving. Add ribbons of fresh basil if you want.